I thought I'd show you how I plan my week with the bullet journal. I'm still loving it and have used almost half the pages in the journal this year. The simplicity and the ease of having someplace central to jot notes and write down random things makes it really work well for me. So, to do a weekly goal/checklist, first I make a grid. This is an ever changing grid as I add things and remove things, but the basic categories are Meals, Spiritual, Family/Home, Personal, Work, and To Do. I've also added a How Has God Worked column to jot down things I notice about God's work in my life this week, and I recently added a Prayer column, so it's always there in front of my mind. Love that addition! So after I write out the grid, I transfer over the items from last week's grid that didn't get completed and mark them as moved over (with an arrow through the empty check box), so I don't miss anything. Then I add in anything else that is coming up that week, or any goals I might have. 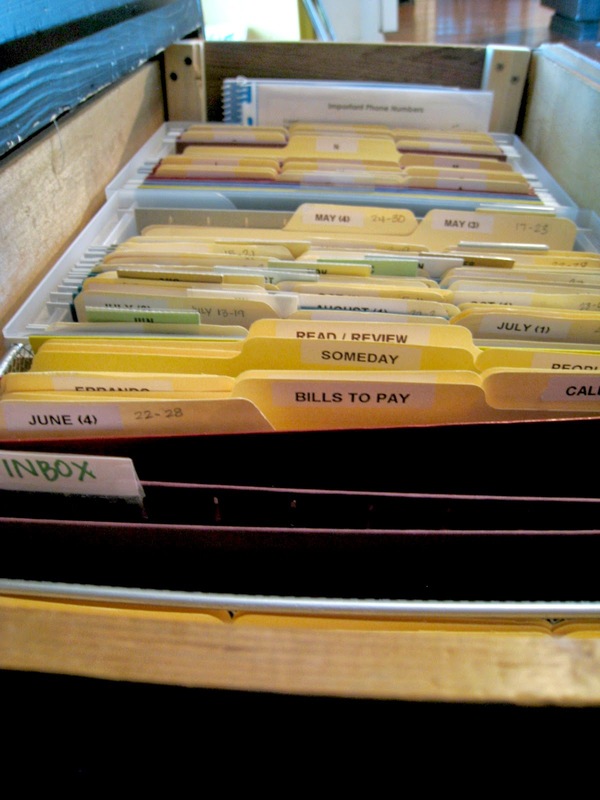 *side note: I just finished setting up a file system based on Getting Things Done by David Allen. I think this is going to work amazingly well with the Bullet Journal, but will post more on this later. 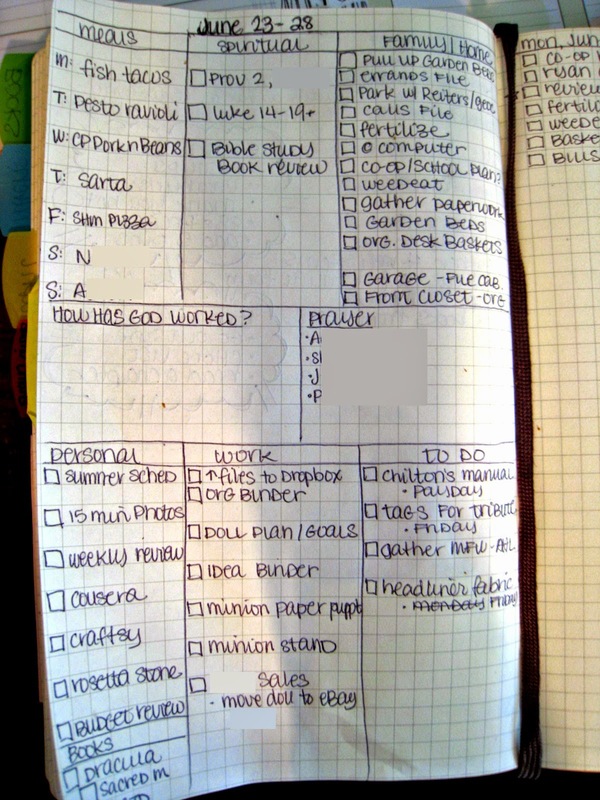 Now, after my grid is filled in, I start my list for Monday. I try to not get more than 5 items listed in one day, but usually break my own rule and list more (like today), and if I don't finish them, they get rewritten onto Tuesday's list. I rewrite them each day, so I make myself sick of seeing them there and DO SOMETHING ABOUT THEM. Does it work? Sometimes. I also set up a loose schedule for the boys. There are no times on here because the only time frame they go by is that they can't do things they want until the stuff on the list is done. That way, there is no RUSHING or STRESS this summer, they just lock themselves up from friends/TV/Video games until they do the work. Pretty low key, but works well for them and me. 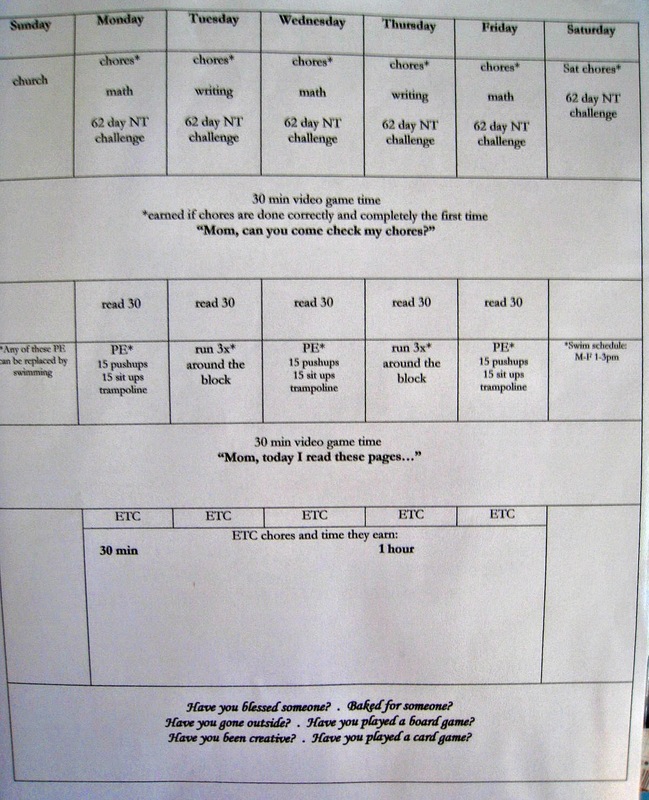 The ETC chores at the bottom are chores I'll list for them to work on so they can earn more screen time. They are usually things that need to get done around the house, or things from the Motivated Moms chore list that they can do. I've been so convicted lately about my own use of time, and watching the boys sit around and wait for their video game time or fight and bicker makes me crazy. I've found, over the years, if I keep a loose schedule for them over the summer, our days are much happier and there is a noticeable difference in the bickering level around here. So that's how my week is shaping up. How about you guys? Has anyone jumped on board with the Bullet Journal? I'd love to see links or pics if you have them, and your ideas for summer routines! Kari - Thank you so much! I am also a sinner, saved by grace, and I am trying to start a bullet journal. I found out about the FB group and when I went to its site, saw you had posted your weekly plan today. What fun to see "How has God worked?" pop out at me when your blog came up!!! I appreciate what you shared and will dig deeper now to see what else you might have to help me get started and to make the journal work for spiritual as well as organizational journaling. God has blessed me today because of you. Thank you!! LOVE God things like that! I've never posted on that group, but had it flash in my head this morning! So thankful you enjoyed it! I love this system and I love how you can tweak it to help every area of your life! Thanks for commenting! I love this so much! I will definitely try to use it this week! Thanks for the inspiration! I've adapted this for my work and it's great! It really helps me to stay focused and feeds my inner desire for a feeling of accomplishment, even though I never get everything done. Thanks! 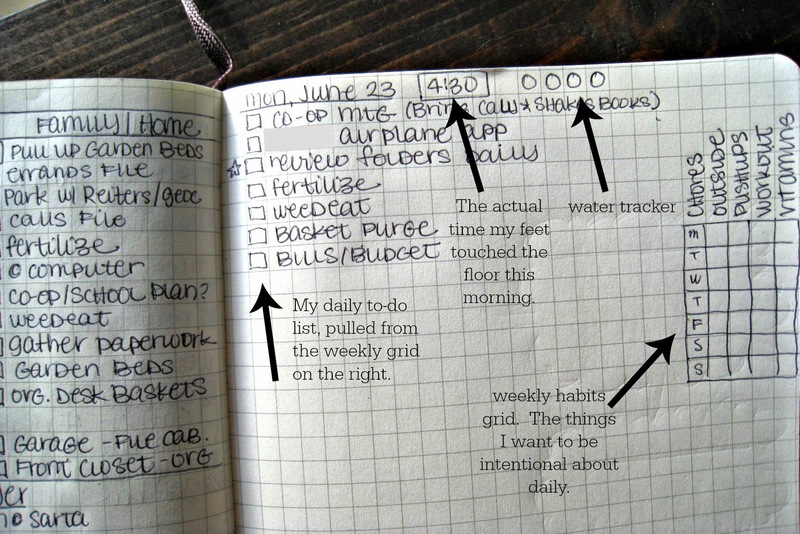 Found you via Bullet Journal Pinterest searching, but what I really love about this is your summer schedule. I think I'm going to do something similar for our regular school year schedule. Thanks for sharing these ideas! I inquire about Bullet Journal, discovered accidentally on a blog today, and I exactly wanted to add it elements to progress in my relation with God... I am so satisfied to have read your message, it gives me ideas, thank you very much!!! Thank you also for this division(sharing) of the picture(table) of organization of time for your children the summer, it is brilliant! I've JUST found your blog and was inspired to start a bullet journal tomorrow ! God bles! !